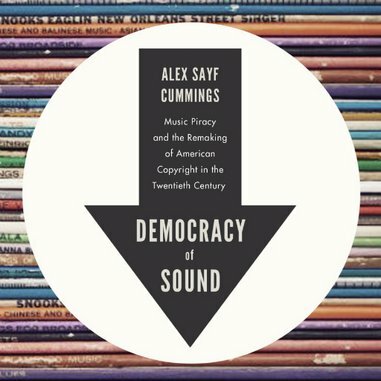 In Democracy Of Sound, author Alex Cummings identifies a man who may be the first individual to pirate music—the awkwardly named Wynant Van Zant Pearce Bradley. Mr. Van Zant Pearce Bradley sold phonographs that “bore the names of. . . noted composers apparently without permission” and also did some copying of “arias. . . licensed to Columbia Records” in the early 1900s. Aside from the magnificent moniker of the perpetrator, what’s the significance of this small blip in the history of the laws that have surrounded music and recording in America? Well, for one thing, it shows that people have been messing around with sound and sound-producing technology—in ways that upset other people—for more than 100 years … basically since music and music technology entered the modern era. Reproduction upset people about a hundred years ago, and corporations wanted their profits protected. How much has really changed? Well. . . a few things. Cummings charts the ebb and flow of copyright law, “always incomplete, always subject to change,” across the century. Back in 1909, the owner of a song “could choose to license the first mechanical use of a composition, but any subsequent renditions were beyond the copyright holder’s control.” Initially the law focused on the devices that played recordings, rather than on the actual recordings. Music differs from many art forms, since it can be written as well as heard, and this caused a headache for lawmakers. After World War II, magnetic tape technology infiltrated recording—making it easier than ever for someone to record a performance—and in the 60s, piracy became closely intertwined with the rise of rock ‘n roll and the counterculture. Previously, many music pirates were jazz fanatics trying to keep old recordings (often neglected by record companies) in circulation. Reproduction of recordings and the taping and disseminating of live shows then moved from the fringes to the center of the pop world. This practice got lumped in with other habits of ‘60s youth, like occupying administration buildings, speaking out against war or capitalism and smoking pot. Then the backlash came. First the states acted—New York passed an anti-piracy law in 1966, California in 1968 (both of these states had big recording industries). Five more states followed in 1971. National reform came not long after, and the record companies didn’t have many outspoken opponents. A few senators “supported the idea of compulsory licensing as a way to limit the record companies’ power, and questioned whether the label should be treated as an author” of musical compositions. But in the end, “copyright law recognized the label’s role in creating the record as much as, if not more than that of a singer, songwriter, or musician.” President Nixon signed the bill on October 15, 1971. Legislation has become even more restrictive since then, despite the fact that in the same period, and certainly in the last two decades, deregulation, rather than increased regulation, has been the norm. In 1976, copyright expanded to “life-plus-fifty-years.” Laws restricted the practice of sampling in hip-hop – taking snippets of other songs and creating new songs around them — so that only the wealthiest rappers can afford it. (Innumerable bands recycle Velvet Underground riffs, but rappers get in trouble for a more explicit tribute to the original tune.) In 2005, “the New York Court of Appeals arrived at the curious conclusion that no sound recordings were currently in the public domain, no matter how old they were.” The year 2010 saw record labels sue the file-sharing network Limewire for 75 trillion dollars in damages. More recently, labels managed to shut down several prominent file-sharing sites like megaupload and made it more difficult for others to share files. How’s everything working out? Cummings points out that “strict intellectual property laws did not deter millions of Americans from copying music, file sharing, or buying bootleg CDs.” So it’s not clear that these steps have been effective. We seem to have one of those situations where everyone loses. Despite the restrictions placed on it, hip-hop offers hints of a possible compromise between labels, fans, and artists. The mix-tape, on which rappers sample or rap over anything they want and give it out for free on the Internet, remains an important part of the genre. It isn’t the kind of demo tape that rock and roll bands use to get attention from labels – though it does do that; A$AP Rocky, who recently released his full-length debut album, famously got a $3 million deal on the strength of his Live.Love.A$AP mix-tape. Mix-tapes offer opportunities for rappers to indulge, experiment, try new things, push new sounds, or just get their ya-ya’s out—without needing to worry about market success. (These releases also serve the market by keeping fans happy between official albums and bringing new fans into the fold, which labels like.) A rapper like Lil’ Wayne used a legendary series of free mix-tapes during the 2000s to aid his transformation from a regional favorite to a rapper capable of selling more than a million albums in a single week. It can pay off big time for rappers—and labels—to give things away free. This same attitude has bled into R&B. Frank Ocean, who released the universally lauded Channel Orange in 2012, gave away his previous album, Nostalgia Ultra, when he was having trouble with his label, which had shelved his work. Ocean circumvented the system, and it ended up rewarding him handsomely. Miguel, who won the Grammy award for best R&B song (“Adorn”) earlier this year, put out three free EPs after his debut album. This Art Dealer Chic series gained him a lot of attention, stoked anticipation for his second album, and contained the original version of his Grammy-winning track. It’s hard to imagine anyone would disagree. It’s just as hard to imagine a world in which the situation is likely to improve.